Biohazard Waste Bag BUY Medical Waste, F116, Biohazardous Waste Disposal, Biohazard Waste Collection, Biohazardous Waste Storage. Biohazardous Waste Bag from Medical Action Industries provides waste collection and transport of biohazardous and infections waste. This Biohazardous Waste Bag is constructed with LLDPE Film and has the Biohazard Symbol printed on the bag. 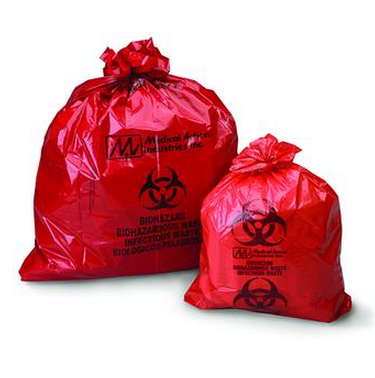 Biohazardous Waste Collection Bags are used to collect, store, and transport biohazardous or infectious waste within a hospital, health care facility, outpatient surgery center, alternate care clinic, physician’s office or medical lab. The Medical Action Biohazardous Waste Bag meets A.S.T.M. Dart and Elmendorf & DOT CFR 49 173-197 standards. 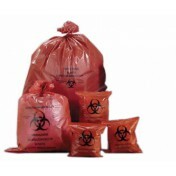 Medical Action Biohazardous Waste Bag Product Number: F116, AMC116. Color: Red with Black print. Meet A.S.T.M. International's 165 gram Dart Impact Resistance Test requirements. Meets Elmendorf & DOT CFR 49 173-197. English and Spanish: "Biohazardous / Infectious Waste with Biohazard".